Shopee, the leading e-commerce platform in Southeast Asia and Taiwan, kicks off its biggest annual regional shopping event, Shopee 9.9 Super Shopping Day. After last year’s successful 9.9 event which saw a three-fold uplift in orders and a five-time increase in traffic, Shopee is upping the ante this year with a 11-day mega shopping event from 30 August to 9 September. With over 500,000 sellers, around 800 brands and more than 60 partners onboard, users can expect up to 99% off from the largest collection of deals and massive giveaways worth over ₱15 Million. 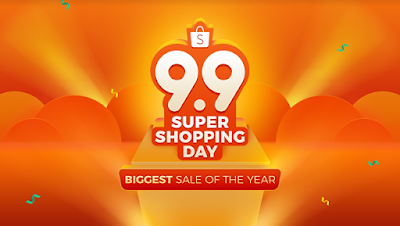 Starting 30 August, users can participate in a 11-day shopping marathon, featuring different back-to-back themed days every 24 hours in the lead up to the peak of Shopee 9.9 Super Shopping Day on 9 September. Users can also look forward to free shipping with lowered minimum spend every day during this period. Key highlights include Super Flash Sale Day on August 30 featuring flash deals as low as ₱99 happening nine times over the course of the day; and Super Vouchers Day on 3 September with a total of over ₱900,000 worth of vouchers to be redeemed. On 5 September, Shopee will also be teaming up with hundreds of leading brands including giants P&G, Maybelline, Samsung, Vivo, Colgate - Palmolive, Oppo, Asus, and more to launch the first-ever Super Brand Festival, comprising the largest collection of deals from major brands on Shopee Mall. Users will get first-hand access to thousands of products sold by their favourite brands across all product categories including Electronics, Mobile and Gadgets, and Health and Beauty. Shopee Shake, the highly popular in-app game that has since clocked over 70 million plays by users across the region, is making a comeback, this time with a new group mode where users can invite others to play at the same time to earn bonus coins, and a supersized coins pool of over 9 million Shopee Coins up for grabs. On Super Shopee Shake Day and Super Shopping Day on 8 and 9 September respectively, users can play up to 18 times in 48 hours for a chance to win Shopee coins, vouchers and prizes. In line with Shopee 9.9 Super Shopping day, Shopee will also be launching a nationwide Shopee Dance competition called Shopee Dance to Win with prizes including an Ace 50” TV and up to ₱100,000 in cash to be won. The dance is featured in Shopee’s second television commercial starring Shopee Philippines’ brand ambassador, Anne Curtis. To qualify, users will need to post a video of themselves doing the Shopee Dance on Facebook or Instagram with the hashtag #ShopeeDancePH. The competition will run from 31 August till the end of Shopee 9.9 Super Shopping Day. Winners will be announced on Shopee’s social media pages on 9 September.